The global satellite M2M and IoT network market is expected to witness significant growth over the forecast period 2018-2023, due to the rising demand of fast and flexible wireless communication across various industries such as transportation and logistics, natural resources, heavy industries, aviation, and government and military. The growing need for secure and high-speed wireless communication and the increasing demand for higher flexibility at low cost are some of the key drivers for the growth of the global satellite M2M and IoT network market. With the advent of computing, sensing, and communication as a part of fourth technical revolution, usage of advanced technologies has increased drastically to reduce manual interventions. This led to advent of Machine to Machine, abbreviated as M2M and Internet of Things abbreviated as IoT. These two technologies assured the connected ecosystem working based on next generation sensors, cloud platform, telematics, and various other technologies. The two technologies catered the urgency of acquiring information from globally scattered resources and to monitor and control them simultaneously. M2M communication typically provide point-to-point information and allows to monitor and control the assets remotely either through terrestrial or aerial network. Wherein, IoT is a step ahead technology and allows to gather massive amount of data from abundant sensors and process it into useful information. IoT utilizes Internet Protocol (IP) based network to interface to middleware and computing platforms to provide predictive maintenance and avoid malfunctioning. According to BIS Research analysis, the global satellite M2M and IoT network market generated $617.3 million in 2017 and is estimated to grow at a CAGR of 32.58% during 2018-2023. North America dominated the global satellite M2M and IoT network market in 2017 with the U.S. acquiring the most significant market share, globally. However, Asia-Pacific is expected to have the highest growth rate during the forecast period 2018-2023. • This report identifies the global satellite M2M and IoT network market under different segments such as end-user, frequency band, and region. • It examines the prime demand-side factors, which affect the growth of the market, and the current and future trends, market drivers, restraints, and challenges prevalent in the global satellite M2M and IoT network market. • The report also highlights the value chain of the industry. • Detailed competitive analysis has been included in this report which focuses on the ¬key market developments and strategies followed by the top players in the market. Additionally, the market share of prominent companies has been included in the existing study which analyzes the competitive strength of the players in the global satellite M2M and IoT network market. • The market for different end user such as logistics and transportation, natural resources, heavy industries, government and military, aviation, and others (banking and retail, connected cars, smart cities, consumer IoT), has been estimated and analyzed. • Different frequency bands of the satellite M2M and IoT network, such L-band, Ku-and Ka-band, S-band, and others (X-band and C-band), have been estimated and analyzed in the report. • The global satellite M2M and IoT network market has been analyzed in the report for the major regions including North America, Europe, Asia-Pacific, and Rest-of-the-World. • A detailed subscription-based pricing model has been included in the report. Furthermore, the report also focuses on providing information on the key participants and future opportunities in the global satellite M2M and IoT network market. 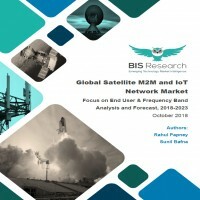 • The study provides detailed analysis of the 15 key players in the global satellite M2M and IoT network market including: Airbus S.A.S., The Boeing Company, OHB SE, Thales Group, Eutelsat S.A., Globalstar, Inc., ORBCOMM Inc., Inmarsat plc., Intelsat, Iridium Communications Inc., GomSpace A/S, Vodafone Limited., Space Exploration Technologies Corp. (SpaceX), Helios Wire Corporation in the Company Profiles section. This section covers business financials, company snapshots, key products and services, major developments, future programs (if any), and the individual SWOT analysis. 8.9 KORE Wireless Group, Inc.
8.16.7 Sky and Space Global Ltd. Figure 8.9 SWOT Analysis: Eutelsat S.A. Figure 8.14 SWOT Analysis – Globalstar, Inc. Figure 8.25 SWOT Analysis – Inmarsat plc. Figure 8.35 SWOT Analysis – Iridium Communications Inc. Figure 8.37 SWOT Analysis – KORE Wireless Group, Inc. Figure 8.47 SWOT Analysis – ORBCOMM Inc. Figure 8.63 SWOT Analysis – Vodafone Limited. Satellites have played a vital role in varied applications from the time of their evolutions and over the time, they have even embraced new development and enabled technological aspects such as weather information, scientific research, telecommunication, multimedia communication, entertainment, and navigation. Moreover, the satellite communication industry has evolved significantly over the decades to include telecommunication application in aviation, commercial, maritime, construction, and military, among many other industries. The global satellite M2M and IoT network market is driven by several factors. The leading ones in the same are the expansion in the global IoT network, launch of new satellite constellations enabling IoT and M2M connectivity, and technological expansion in associated components in the IoT and M2M network. Rapid expansion in the IoT network to connect the globally scattered resources at a central location and to disseminate the insights across the internal network are the predominant factors which will drive the growth in the satellite M2M and IoT network market. To cater the market with more value propositions and to reduce the investment costs of the end-user, satellite operators and device manufacturers are together developing robust solutions that can potentially switch between terrestrial and satellite network as required. Moreover, it has been witnessed that satellite operators are also collaborating with IoT and connectivity application developers to advance the end to end solutions capability. Nano satellites, which are low cost and can potentially support M2M and IoT application are gaining huge traction in the market. Many new startups are evolving in the market that are betting to cater the commercial M2M and IoT network connectivity demanding end-user with their nano-satellite constellation. Few of the startups are Sky and Space Global (U.K.), Myriota (Australia), Fleet Space (Australia), Astrocast (Switzerland) and Helios Wire (Canada). Moreover, these players are also looking ahead to drastically reduce the subscription prices for the services by 85% by 2023. Airbus S.A.S., The Boeing Company, OHB SE, Thales Group, Eutelsat S.A., Globalstar, Inc., ORBCOMM Inc., Inmarsat plc., Intelsat, Iridium Communications Inc., GomSpace A/S, Vodafone Limited., Space Exploration Technologies Corp. (SpaceX), Helios Wire Corporation are some of the major players in the global satellite M2M and IoT network market. The preceding figure illustrates the increasing revenue generation of the global satellite M2M and IoT network market over the years. The market reported a revenue of $617.3 million, in 2017 and is expected to grow at a significant CAGR during the forecast period 2018-2023. The global satellite M2M and IoT network market has been segmented into six end-users: transportation and logistics, natural resources, heavy industries, government and military, aviation, and others (banking and retail, connected cars, smart cities, consumer IoT). The logistics and transportation end-user acquired the largest share, however, connected cars, banking and retail end-user are expected to grow at the highest CAGR during the forecast period, 2018-2023. In addition, the global Satellite M2M and IoT network market is also classified depending upon the frequency band such as L-Band, Ku-and Ka-band, S-band, and others (X-band and C-band). L-band reported the highest revenue in 2017 and is estimated to grow at the highest CAGR during the forecast period, 2018-2023. North America accounted for the highest share of the market in 2017 owing to the maximum number of satellite launches by the U.S. and generated highest revenue for the service provider companies. The region is heading forward due to developments led by American companies and high motivation among the end-user to use advanced technologies. Logistics and transportation end user of satellite M2M and IoT network consumed the highest share of North America market in 2017, which was followed by government and military, heavy industries, aviation, natural resources, and others. The Asia-Pacific region is expected to foster high growth rate in the global satellite M2M and IoT network market during forecast period, 2018-2023. The growth of the region is mainly driven by continued developments in satellite technologies by the governments of different nations in the Asia-Pacific region, which are focusing on developing innovation in space technology to transform the national economy and strengthen security.